The Standard & Poor's 500 Index has climbed 41% in the past three years – but there's a group of stocks that is tearing past it as the outlook for their industry gets brighter. The three LNG stocks listed – Cheniere Energy Inc. (NYSE: LNG), Chicago Bridge & Iron (NYSE: CBI), and Golar LNG Limited (Nasdaq: GLNG) have climbed 609%, 149%, and 132%, respectively. Money Morning Global Energy Strategist Dr. Kent Moors first told readers about LNG's potential back in 2010. 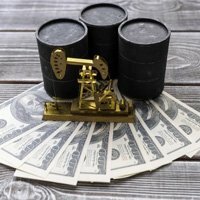 Since then, Cheniere Energy Inc. (NYSE: LNG) had climbed from $6 per share to $43 – a gain of 628%. Worldwide demand for liquefied natural gas has doubled since 2000, and many expect that demand to double again by 2025. "The bottom line here is that the liquefied natural gas (LNG) revolution is set to hand us one of the best investment opportunities of the decade – and U.S. investors just can't afford to miss out," Moors told Money Morning Executive Editor Bill Patalon in October. "And this is a stunning reversal from where the industry has been. I mean, just seven years ago, all the so-called 'experts' agreed that the U.S. would be using LNG imports to meet 15% of this country's gas needs by 2020. But now the U.S. is poised to become a hefty LNG exporter." That's why this LNG stock chart is not a fluke. These stocks will continue to outpace broader market gains. Cheniere Energy Inc. (NYSE: LNG) was the first company to receive federal approval to build a major LNG exporting facility in the United States in 2012. It's most expansive operation is in Louisiana's Sabine Pass. That's where Cheniere expects to export 500 million cubic feet of natural gas per day by the end of 2015. The company is working on another LNG terminal project in Corpus Christi, Texas, and has just begun constructing another $12 billion processing facility. 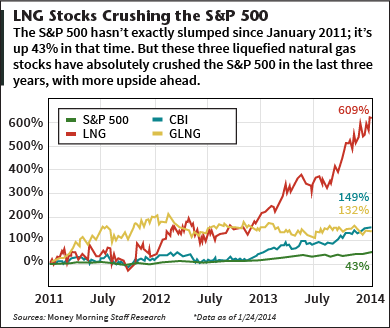 Since the start of 2011, LNG stock price is up an incredible 609%. In the same time, the S&P 500 has posted a 43% gain.